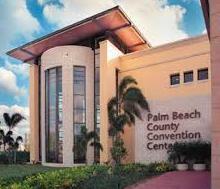 Since opening its doors in January 2004, the Palm Beach County Convention Center has been the place for events of all kinds. Offering 100,000 q. ft. exhibit hall space, 25,000 sq. ft. ballroom and 20,000 sq. ft. breakout space, the Convention Center provides an awesome venue for conventions, trade shows, conferences, meetings and any social events. Every year, local schools and colleges use the PBC Convention Center for graduation ceremonies. From Palm Beach Jewelry, Art and Antique shows, Home and Garden to RV shows and the Countdown2Zero annual adoption event, this huge facility will accommodate any need. Located across from CityPlace, close to shopping, restaurants and Muvico Theatre. For your convenience, the brand new Hilton Convention Center Hotel sits right next door with 12 story and 400 rooms as well as several hotels nearby. Parking available for over 1,100 vehicles, loading docks and great catering service, this is the best venue to host your next event.